Since my apartment is over 100 years old, the outlets aren't so strategically placed. And with cats that would no doubt love to mess up my Christmas tree, I decided to put my little tree up off the ground this year. It's a light purple, pre-lit tree that hangs out perfectly on my television stand. I added a strand of colored lights as well as some bright bulbs. I love the non-traditional colors and how they fit right into my colorful, eclectic space. 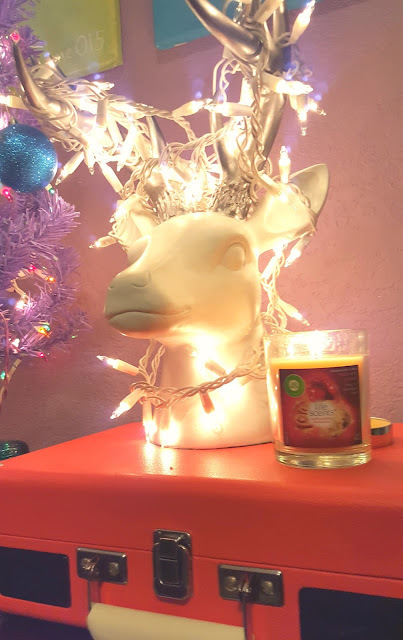 I also had a spare strand of white lights, so I ended up wrapping them around my beloved deer's antlers. I adore how fun and unexpected it looks! He looks so festive now. In my living room, I've been burning Air Wick's Spiced Apple Crumble scented candle. The combination of apple, vanilla, spices, and warm pastry crust smells so delicious. My apartment smells like I'm baking apple crisp – and I wish I could say I'm that adept in the kitchen! 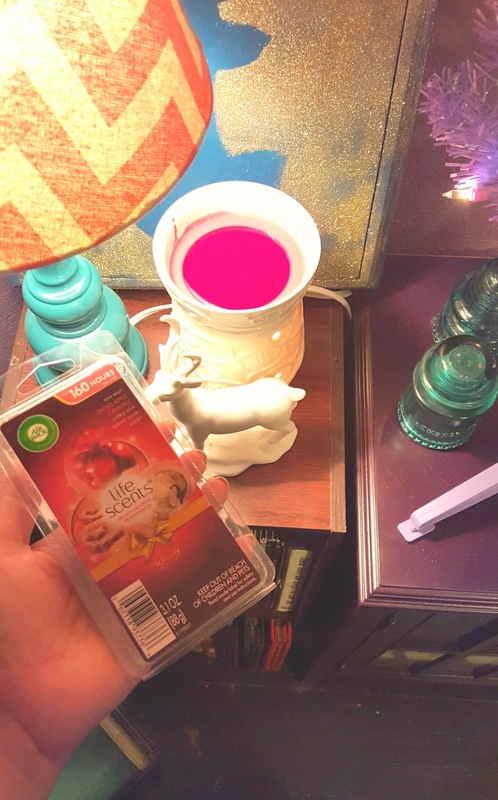 On the other side of the Christmas tree, I've been melting Air Wick's Spiced Apple Crumble wax melts. Unlike some wax melts I've used, these really keep their scent and disperse the fragrance throughout the whole room. 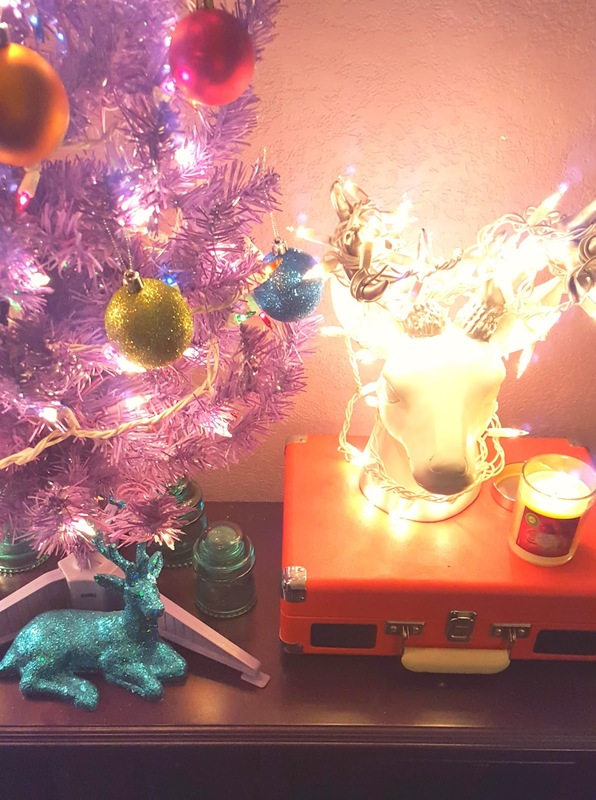 Around and underneath my Christmas tree, I placed turquoise glass electrical insulators and my sparkly turquoise deer. I'm looking for a small Christmas tree skirt to complete my holiday vignette! I'm also on the market for some old-school Christmas records to play on the turntable. 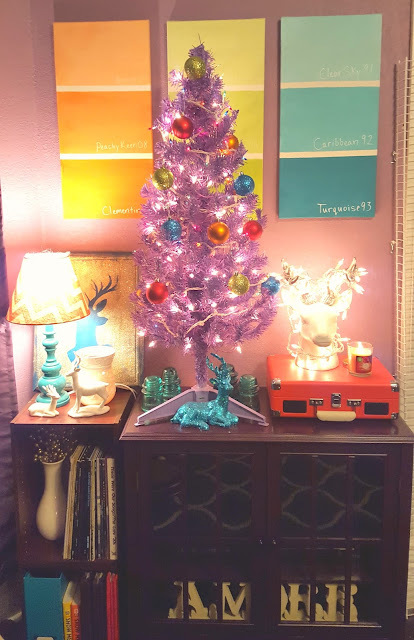 I just love the thought of turning on my colorful tree, lighting my Spiced Apple Crumble candle, sipping on spiked eggnog, and listening to some vintage Christmas tunes. Doesn't that sound cozy?! Air Wick also sent me their Emerald Woodland scented candle and wax melts. I've been using these in my office because 1) I love the forest green color with my turquoise and gray decor, and 2) this is such a soothing scent. Some candles that feature pine can be sooo potent and overwhelming. Not this one. The Emerald Woodland blends the scent crisp evergreen with the fragrance of just-baked sugar cookies. The combination caught me off guard, but it's perfect. 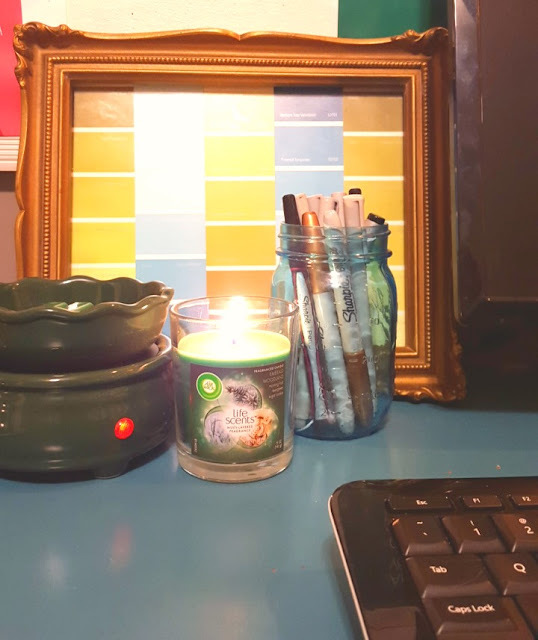 The warm vanilla balances out the crisp pine wonderfully – it's a sweet, warm, fresh smell that I can't get enough of on chilly nights in my office. Air Wick is giving one lucky The Lovely Side reader a prize back containing 2 Emerald Woodland scented candles and 2 Spiced Apple Crumble scented candles. Enter using the widget below! Comment to enter, then earn bonus entries via social media. Good luck! That spiced apple sounds heavenly! Mistletoe scent smells like the holidays to me! 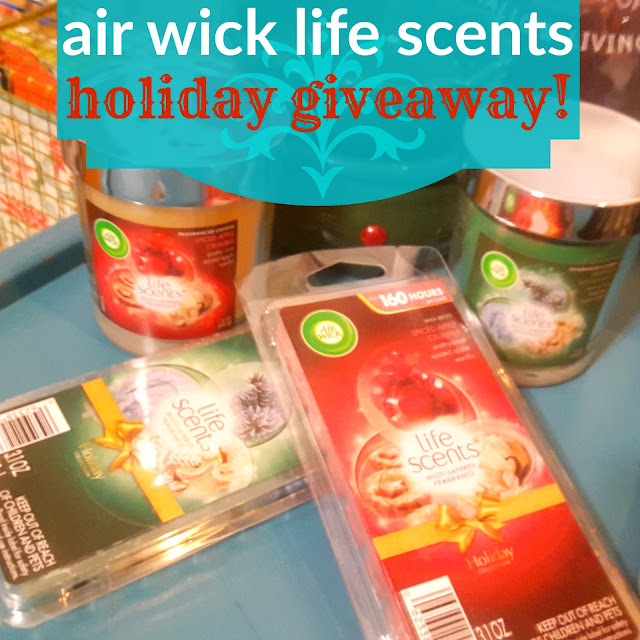 It's a mix of pine tree scent and a hint of sweetness - which is exactly what it would smell like if the AirWick Emerald Woodland and Apple Crisp candles were burned together! i go crazy decorating for the holidays! i love smells of baked goods filling my house too, apple caramels and cinnamon sugars! Around the holidays I always like the pine scent. Evergreen smells like holiday spirit to me. Apples and cinnamon always smells festive to me. Apples, Fig or Plums smell like holiday spirit to me. Not feeling festive yet, but this might do the trick...Cinnamon is definitely the seasonal aroma. I love the smell of gingerbread for the holidays. I like to decorate with a lot of red and white.